Pured concrete paving gets dirty like any outdoor surface. It also may experience stains from oil and mold and deteriorate with prolonged exposure to salt and water. Periodic cleaning will remove contaminants and restore your concrete’s appearance. And resealing every few years will help it maintain its good looks longer, make it easier to clean next time and prevent deterioration from ice-melt salt and moisture. The right surrounding landscaping can help too. When concrete paving is lower than the surrounding landscaping, dirt and debris wash onto the surface and settle there. To keep concrete paving clean, it should be slightly higher than the ground around it and sloped for positive drainage away from your home. Turf and mulch groundcover will prevent muddy splashing from bare earth. 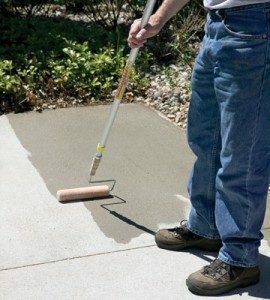 You don’t need fancy equipment to clean concrete. A leaf blower, stiff push broom, soapy water, a garden hose and some elbow grease should do the trick. Pressure washing will save time and effort, but be careful not to damage the surface. Use a 25-30 degree tip held at a 45 degree angle about 6 in. from the surface so you don’t inject too much water into slab or wear away the surface. To avoid dirty streaks, start at the lowest area and work your way toward the uppermost edge. Then rinse the entire area in the opposite direction. For oil and rust stains, choose a chemical stain remover designed for the purpose. This includes alkaline, acidic or enzyme products. Follow label instructions carefully to avoid safety hazards. Be patient and resist the temptation to blast away with the pressure washer or be prepared to accept the damage it inflicts on the surface. Today’s concrete sealers may be solvent-based or waterborne. Some penetrate while others just provide a thin surface coating. They also may be specifically formulated to block the damaging effects of ice-melt salt. 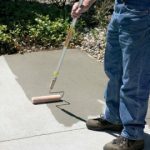 Applied properly, any sealer is better than no sealer and most can be applied with a simple low-pressure garden sprayer or a paint roller mounted to a long extension pole. Choosing the best sealer depends, in part, on the characteristics of the surface. For instance, wet-look coatings enhance the color and texture of decorative concrete such as exposure aggregate stamped concrete. Whereas deep penetrating solvent based sealers offer superior salt protection without altering the appearance. It’s important for any concrete sealer to be able to breathe to allow moisture to escape. However, cure and seal products applied soon after new concrete is finished are designed to slow evaporation during the curing process. This increases the strength of the concrete. Professional-grade sealers last longer and perform better than the consumer-grade products typically available at home centers and hardware stores. However, they may be more difficult to apply. 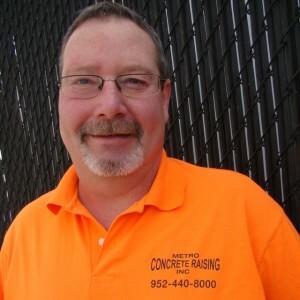 At Metro Concrete Raising, we seal the new concrete we install and use only the highest quality professional products. We also are available to do periodic pressure-washing and resealing of any concrete we work on. 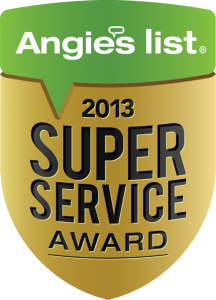 Call today to schedule routine maintenance so your concrete looks its best and lasts.